Janus la Cour (1837-1909) was one of Denmark's most accomplished 19th century landscape painters. Born in Aarhus, in Jutland, he attended the Royal Academy of Fine Arts in Copenhagen between 1857-1854, during which time he came under the tutelage of P.C. Skovgaard, one of the masters of the Golden Age of Danish painting. But unlike Skovgaard, Janus la Cour never sought to infuse his landscapes with any inkling of romanticism. His endeavour seems always to have been to capture the essential simplicity of natural beauty. Our present painting shows a view across the heathland surrounding the so-called Himmelbjærget, or "Sky Mountain", a hill in eastern Jutland which is one of Denmark's highest points. It stands at 147 meter, located between the towns of Ry and Silkeborg. In the second half of the 19th century, following a general wave of nationalism then prevalent in Europe, the hill started to play a role in nationalistic lore. The artist has taken up a position somewhere behind the Himmelbjærget, allowing it to rise up in the distance, with Silkeborg (in those days more akin to a village than a town) being virtually unnoticeable in the distance. It is clear that La Cour wants the viewer to experience the essential stillness of the heathland surrounding the hill. Although a small path meanders out of view in the distance, towards Silkeborg, there is not a trace of human life to be found. The observer is drawn into the painting through the gnarled tree and bracken in the foreground, and further ahead there is only nature and low-hanging sky. Although La Cour made other paintings of the area around Himmelbjærget during the period 1867/68, our work is unusual in that it is one of the larger canvases that the artist produced during his career. It is as if he was trying to experiment with a way of capturing landscape almost by viewing it through a "wide lens". As his career progressed throughout the 1870s and 1880s, he would continue to depict the loneliness of natural scenery - often abroad, in France, Italy and Switzerland - but more often than not he woud look at landscape detail from a close-up angle, or at least with a much reduced vista. La Cour achieved success as a painter during his lifetime, and by the time he died in 1909, he had participated in international exhibitions in Stockholm, Berlin, Vienna, Munich, Paris, Chicago and London. Today, his work is represented in all leading Scandinavian museums, with the AROS museum in La Cour's native Aarhus holding the most significant collection of his work. When the present painting was initially sold at auction in 1879, it fetched a sale price which exceeded that of a painting by J.C. Dahl and went some way towards equalling the value achieved for work by C.W. Eckersberg sold at the same auction, which probably says much about the impressiveness of this quietly monumental work . 1. See p. 4 (lot nr. 10) of the catalogue of Auction dated 1 December 1879 held at the Kunstforeningen in Copenhagen. Rikard Magnussen, Landskabsmaleren Janus la Cour. 1837-1909 (Copenhagen, 1928), p. 165, nr. 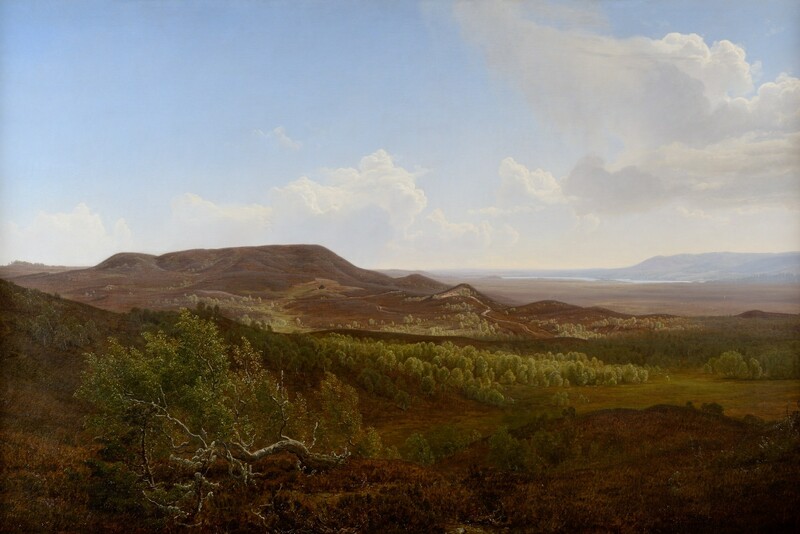 188, as "Udsigt over Silkeborg med Himmelbjærget" (View of Silkeborg with Himmelbjærget). See for the work of Janus la Cour generally:AROS Kunstmuseum (ed), Janus la Cour. Stilhedens Maler, exh. cat. (Aarhus 2007), esp. pp. 25-37.